Creating and making your own kitchen staples isn't hard- yes, sometimes it can be time consuming depending on what you decide take on. For me, I prefer to make items that tend to be more expensive in stores but very inexpensive to make at home. In my own kitchen flavored salts, instant chai tea, nut butters, jam, veggie stock are on constant DIY rotation; BBQ sauce, ketchup, those type of items I tend to purchase from a store without feeling guilty. No one is perfect, I don't feel it is realistic to make all your condiments from scratch. I do think, however, homemade rivals any store bought item. With my abundance of cherry tomatoes from the garden along with 4 pints purchased from Sanborn Mills Farm I set to work oven drying a massive batch of cherry tomatoes. Let me tell you, these do not disappoint. The drying time takes a bit of effort, but it is inactive time- literally prep your tomatoes, pop them in the oven and let oven do the rest of the work. If you have a dehydrator, even better (I'm a little jealous)! It is important that the herbs used are completely dry - if they are fresh there is a great chance of bacteria forming in the jars. You can easily make a small batch or a large one, the method is super simple - just make sure you use them up in a decent amount of time. By far, our favorite flavor combination is garlic & crushed red pepper- simply amazing! Rinse and dry your cherry tomatoes - sliced cherry tomatoes in half and place on a rimmed baking sheet. Cook in the oven from anywhere between 2.5 - 4 hours- this will all depend on the size of your tomatoes and how many you are roasting at a time. The tomatoes are done once they appear shriveled and "dried". 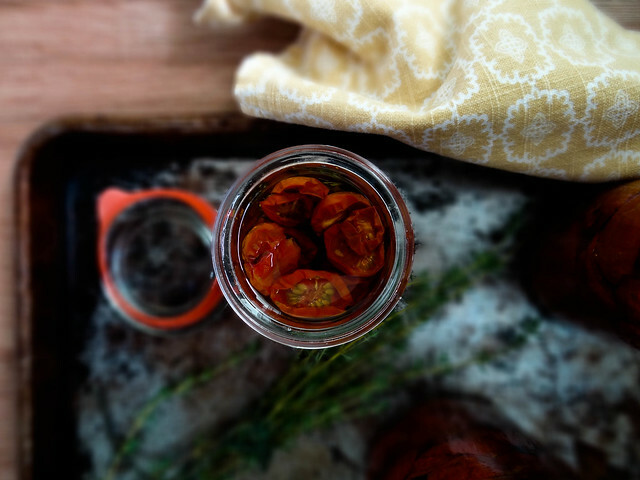 Sanitize your jars that the tomatoes will be stored in- this can be done in either the dishwasher, hot soapy water with sanitizer made specifically for food preparation or a hot water bath. 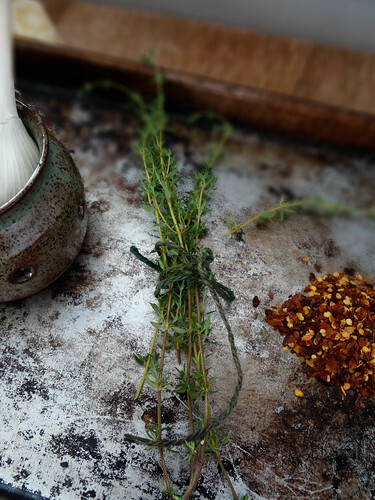 Fill your jar about 1/3 of the way , sprinkle generously with salt and half of your lemon juice & your seasonings. Repeat until you have 2-3 layers which will be dependent on the size of your jar, leave about 1/2 inch of head space. Pour olive oil into the jar leaving a 1/4" of space at the top, however ensure that your tomatoes are completely covered. To be safe, store tomatoes in the fridge and use within 1-2 weeks. 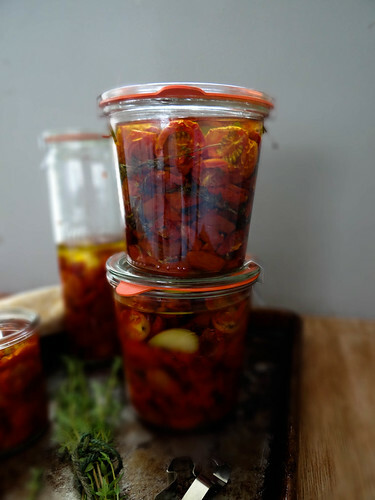 The olive oil will solidify when stored in the fridge, simply plan ahead and remove from the fridge about 10 minutes before you plan to use the tomatoes. 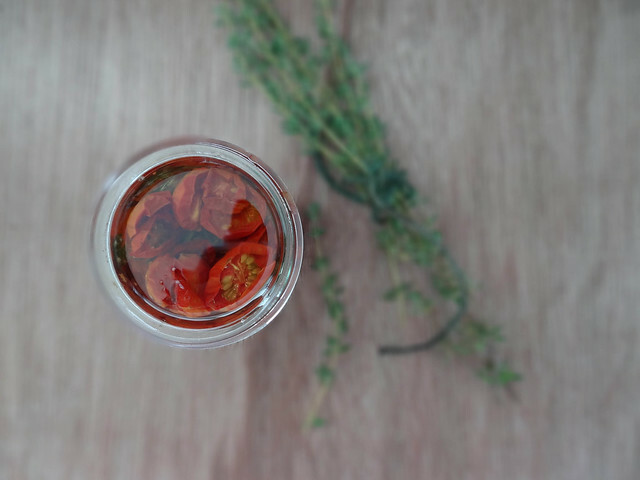 Note: I did store my smaller batches made with only garlic and crushed red pepper at room temp and used within 4 days, however this method is very controversial due to the possibility of bacteria / mold forming and growing, therefore I would recommend you to store in the fridge unless you personally feel comfortable otherwise. Yum! Somehow I've never done this myself. I especially love half-dried roasted tomatoes so I usually dig in before they make it all the way to dry. But you have inspired me to try. Maybe I'll make such a big batch that I can have some half-way and the rest dried. 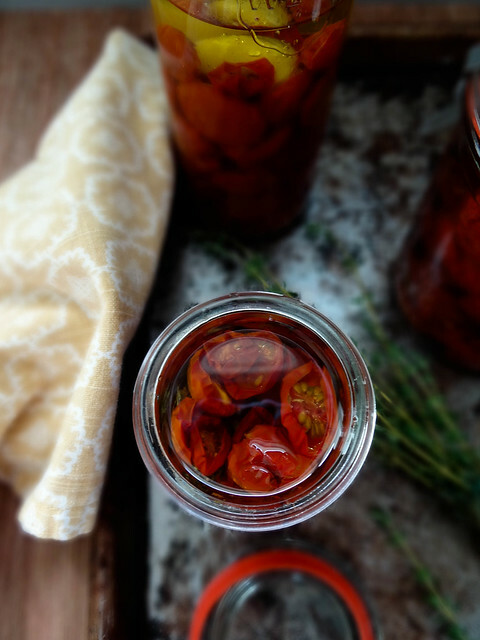 Oven-dried tomatoes are a favorite around here! I use them on/in everything, but they're also super good just on their own (they're like tomato candy!). Total veggie candy! I love adding a hand full with the infused oil into homemade biscuits - SO GOOD! i am addicted to sun dried tomatoes. i never realized how easy it was to make them myself! thanks for another great demo, lady! I made so many slow-roasted toms this summer with the bounty from the garden but I ate them all!! Boooo, I so should have saved some like this! Nice! I love oven-dried tomatoes in veggie sandwiches. I think they taste better than sundried, which usually has a stronger taste, I think? These look really good! I agree, plus you get the chance to add some extra flavoring! Totally agree with you Richa, the sun-dried are good when they are super small but I prefer the oven dried method! you make this process seem so simple! Thank you for sharing, I must try this soon. Thanks for stopping over, it really is super simple! Ooo I bet the yellow tomatoes dried or SO PRETTY! I need to invest in a dehydrator one of these days! This is so cool. I am going to try this tonight. Thanks.